BRL Test is your authorized Com-Power Distributor. 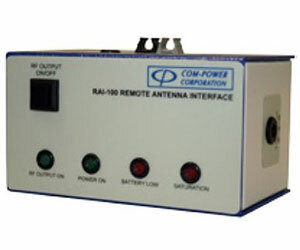 Com-Power?s RAI-100 Remote Antenna Interface is a compact controller which can be used to enable/ disable RF measurement circuit and monitor saturation and battery low conditions remotely via a fiber optic cable up to 30 mtrs in length. Use with AL130R loop or AM-741R monopole antennaes.